Obviously St Ives does not (yet) have its own airport - but Newquay Cornwall Airport is only a 50 minute drive from town. They offer a wide range of routes to and from both UK and International airports. 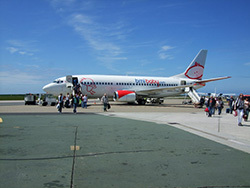 Newquay Cornwall Airport - Copyright © Richard Hoare and licensed for reuse under this Creative Commons Licence.